Sony Alpha A5000 sensor review: Seriously small, but big on performance? With the introduction of full-frame A7 mirrorless models Sony has quietly dropped the NEX naming of the APS-C format cameras, uniting all under the Alpha brand. 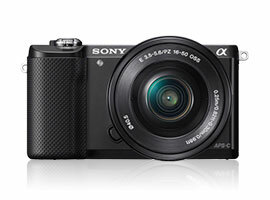 Externally, the A5000 looks very similar to the earlier 16-Mpix NEX-5T. Inside the compact body, claimed by Sony to be the smallest and lightest of its type at 7.4oz (210g), it adopts a new 20.1-Mpix CMOS sensor and Bionz X processor with sensitivity up to ISO 16,000. Despite the modest increase in pixel count and new processor, the specification is in-fact more like that of a revised NEX-3. While it does have the WiFi with NFC capability of the NEX-5T, it lacks the on-chip phase-detection pixels of that model and fast 10 fps burst rate. This new model can achieve up to 3.5 fps with the focus locked, otherwise it’s limited to just 2.5 fps. It also has a 3.0’ LCD with a 180-degree tilt option. But, it follows the NEX-3N in that can’t be tilted downwards (for overhead shooting) and, similarly, adopts a lower-resolution 460 K-dot, non-touchscreen panel. With a 60/50i (interlaced) option to the usual 25p and 24p Full HD modes, even the video features are alike. It’s available for pre-order in white, black or silver-finish at $499, including the stabilized 16-50mm f3.5-5.6 OSS PZ powered and retractable zoom. 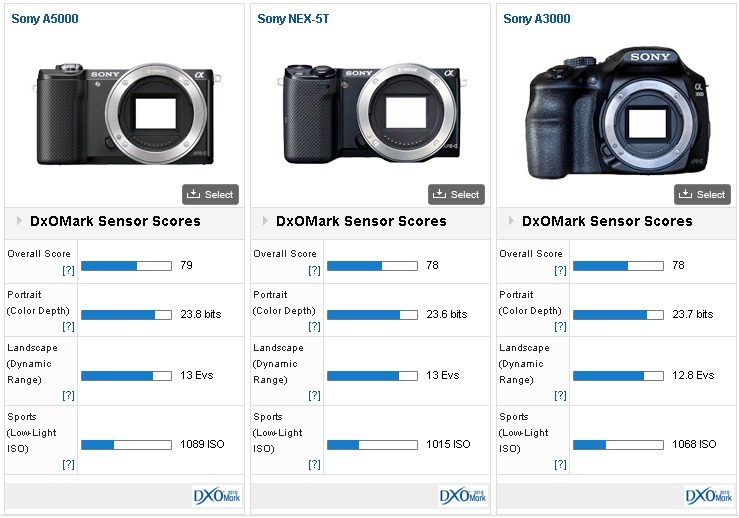 With the new A5000 achieving a DxOMark a score of 79 points it places the new Sony ahead of the 16-Mpix NEX-3N, which scored 74 points overall. The A5000 has slightly improved color sensitivity of 23.8 bits, compared with 22.8 bits for the older sensor and it has a wider dynamic range, up from 12.5 Evs to 13. However, low light capabilities are practically identical. It’s a good score placing it on a par with the firm’s 16-Mpix NEX-6 and 24-Mpix Alpha SLT A77 models and ranked 39th overall in our database. 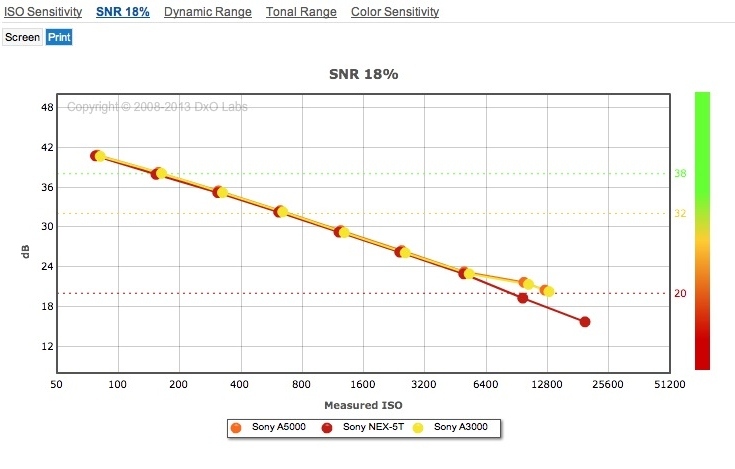 Alongside the now discontinued Sony NEX-5T, the new higher resolution count sensor in the A5000 performs very similarly. With practically the same color depth, dynamic range and low-light capabilities that’s a quite an achievement, although to be fair, it’s still only a modest hike in pixel count. 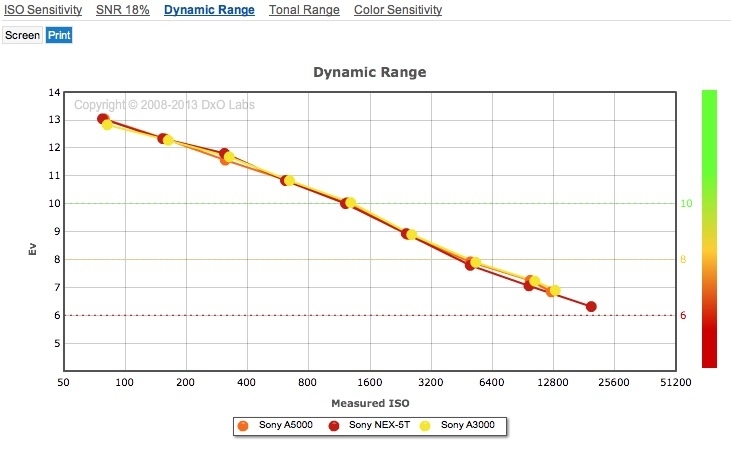 When compared to the performance of the A3000 it’s pretty obvious that Sony is using the same sensor, although the slight variation in figures maybe due to some minor tweaking. The new sensor in the A5000 (and A3000) is an excellent performer with comparable noise levels to the older 16-Mpix chip. 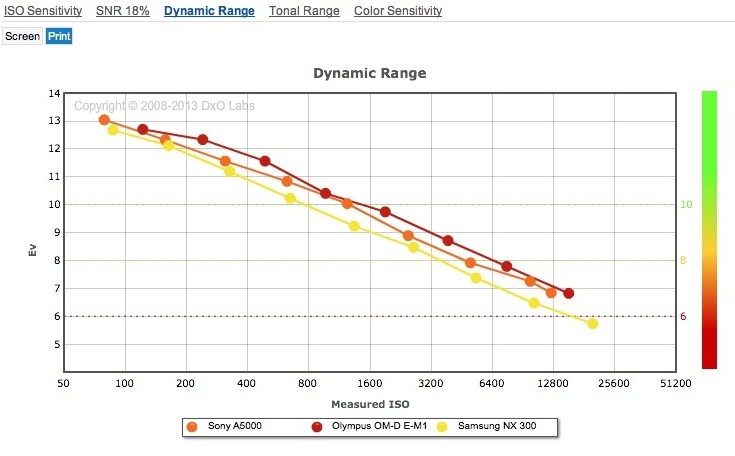 Dynamic range is practically identical between all three models. 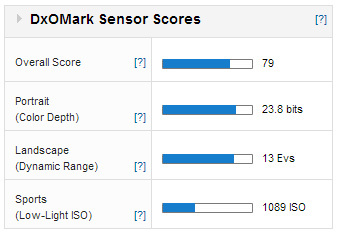 Although the Sony isn’t competing directly with the Olympus OM-D E-M1 the differences between sensor scores indicate the new chip maintains the slight advantage over current 16-Mpix MFT sensors At base ISO, it has +2/3rd of stop advantage in color depth but only +1/3rd stop wider dynamic range. 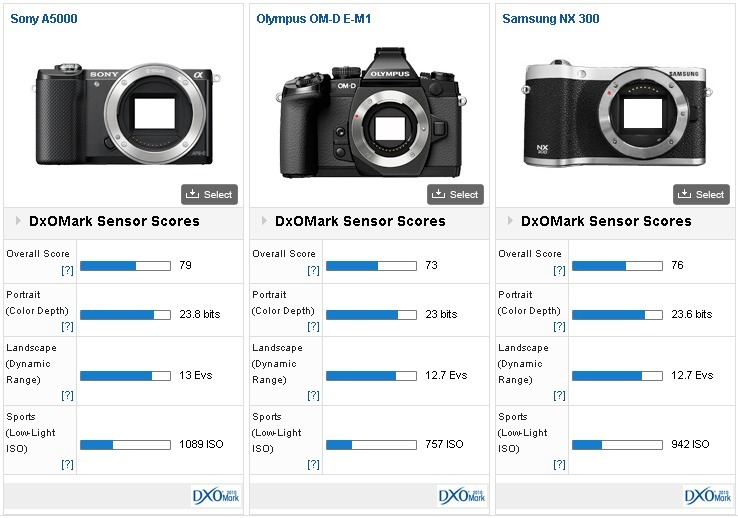 Noise levels are lower in the A5000 but at higher ISOs the Olympus sensor has the slight edge in both dynamic range and color depth. Against the high-end Samsung the newer Sony sensor shows some very slight improvement but it’s mainly in controlling noise levels. As a result both color sensitivity and dynamic range are marginally better at each ISO setting. 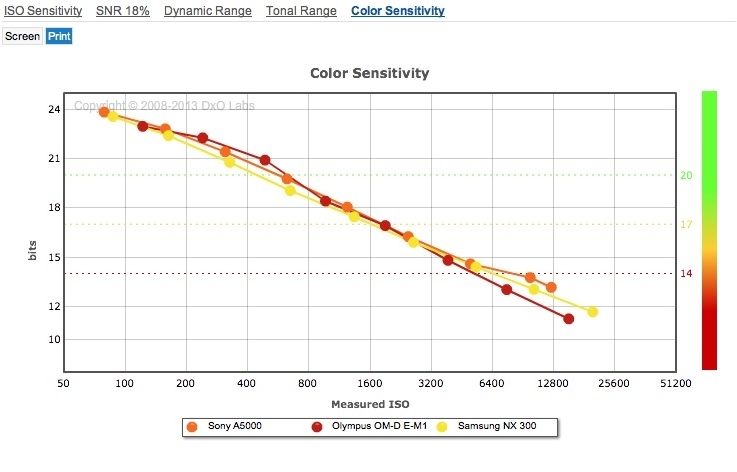 Color sensitivity is very similar between all three models, though the Sony has the advantage at lower ISOs. Although the A5000 isn’t quite the replacement for the NEX-5T as it appears, and is unlikely to be tempting enough for enthusiasts, the sensor at least is a very good performer. Although it lacks the on-chip PD-AF pixels required for faster autofocus of the older 16-Mpix sensor in the NEX-5T, it concedes nothing in IQ while the higher pixel count is promising. At around $499 it doesn’t look overpriced.